Ok, I have to truthfully say that when these books landed on my doorstep I wasn't sure what to make of them. They seem a bit....odd. And they also looked like space fillers. And maybe they are that but they are also very well-loved by my two year old so I'm here to talk about them! Mama's Little Ducklings is the new most requested read in our household at the moment (as far as Bookworm3 is concerned). I don't know whether she likes the sparkles, the flaps she can lift up on each page or the ducks themselves. At any rate, she likes reading "Mama Duck!" and this book travels the house and rides in the car with us whenever we go places. In this short story, Mama Duck lays 5 eggs, 4 of which hatch and one of which rolls away. The hunt is on for egg #5. Will they find it?! What sort of children's book would this be if they didn't?! (SAD!) No worries, they find it. Rainbow Butterflies suits our littlest bookworm well as she has been learning her colors most diligently. (Favorite color? Pink. When that color is not available, red will do.) She enjoys looking for the Play-Doh butterfly of color on each page. I did notice that Amazon has the "search inside" option available for each of these titles so if you want to get a feel for how the books are laid out and illustrated, the opening pages are provided. If it's not quite obvious from the big "Play-Doh" logo on each book, the animals, flowers, houses, trees, etc., are all of Play-Doh origins. 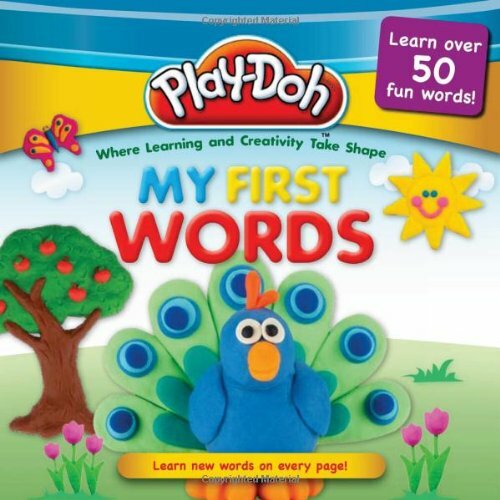 PLAY-DOH: My First Words is a padded board book, distinguishing it from the others. (I like the peacock on the cover.) 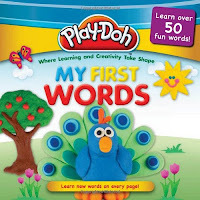 Inside you'll find all of the items made with Play-Doh and labeled for the purposes of expanding a younger reader's vocabulary. You'll see animals such as owls, cardinals, elephants and lions. There is a page discussing things you'll find in the sky, such as the moon, stars, planets and rainbows. There is also a page full of fun vehicles like an ambulance, fire truck and monster truck. It's a cute book. This one, same as the others, make you want to crack open a can of Play-Doh and attempt making some creatures all by yourself! 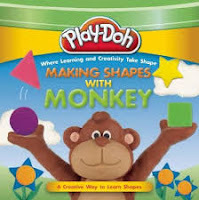 PLAY-DOH: Making Shapes with Monkey is another in the "first concepts" series and it teaches exactly what you can correctly assume that it does: shapes. Monkey likes to make shapes. Monkey invites you to play a fun game with him wherein you identify the different basic shapes. On each page spread you'll see monkey in different settings. For example, on one page you'll find him next to a tree, pointing out Mama Bird and the birdhouse in a tree. How many shapes can you correctly identify on this page? And so on and so forth in like manner. And as a reward for all of your hard work in identifying the shapes? Monkey makes you a heart award! Again, cute. 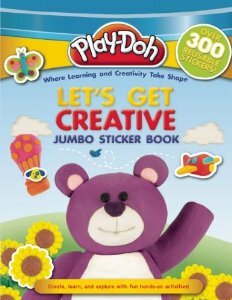 Lastly, we were sent a copy of the PLAY-DOH Let's Get Creative Jumbo Sticker Book to check out. My girl LOVES (and I mean loves) stickers. So this JUMBO sticker book is quite the treat! This sticker book looks much like many other sticker books you might pick up - there are stickers to choose from and plenty of page scenes to decorate. You can use the stickers to create stories, make collections, give animals various faces, build ice cream cones and explore nature. This title covers all the basics and has proved to be delightfully entertaining. Play-Doh and Mommy are good friends, in an odd sort of way. My children get an absolute kick out of playing with Play-Doh. I absolutely hate cleaning it up. As a result of both things I just mentioned, Play-Doh is a rare and special play treat in our home. 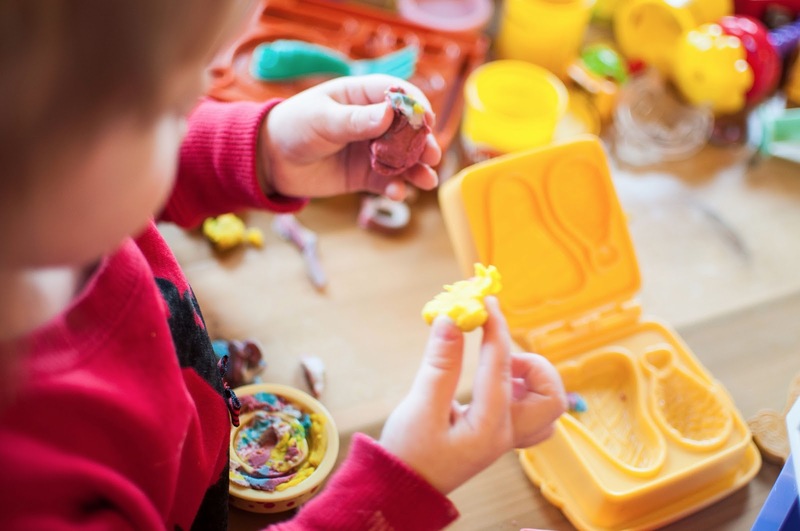 Our box of Play-Doh and associated equipment comes out 2-3 times a year and both occupies and entertains the children for stretches of up to 3 hours at a time. No breaks. No joke! Play-Doh is one of those childhood Things of Wonder and I'm happy for my kids to enjoy it periodically. It certainly serves a good purpose in allowing me a chance to accomplish any variety of projects of my own while my children are engaged in a creative activity. 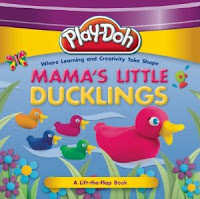 We're happy with Play-Doh and also these books! Thanks to Silver Dolphin Books for sending all of the above titles our direction in exchange for our honest thoughts. I was honestly surprised by how well my children liked them and we've had a great deal of fun with them. Thanks!